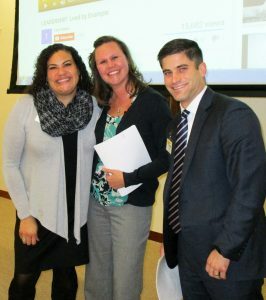 The theme of the February 2017 Leadership Kenosha class was,”You Either Lead By Example or You Don’t Lead At All,” which explored the Kenosha business climate, while learning about local businesses, and discussed the skills needed to lead the process of change. The meeting was hosted by ULINE at their Pleasant Prairie headquarters and featured a tour and overview of the companies’ tremendous growth. The day included a panel on Business and Economic Development in Kenosha County, lunch with Kenosha County Executive Jim Kreuser, a presentation by Esther Letven on how to manage and get through change in your life (which the class agreed that this helped us not only to deal with our staff and coworkers in times of change or transition, but also helped realize for ourselves what we need to do ourselves as leaders in times of change), and the final piece of the day: a discussion and a hand-on activity presented by our Leadership Kenosha classmates, Tom, Amanda and Jennifer. Their presentation was on “Leading by Example” and demonstrated that to be a good leader, you need to be supportive with your team and help guide them to success. This month’s class was a good one, teaching us all that to be good leaders we need to show the way, and also be willing and able to deal with change as it comes our way!